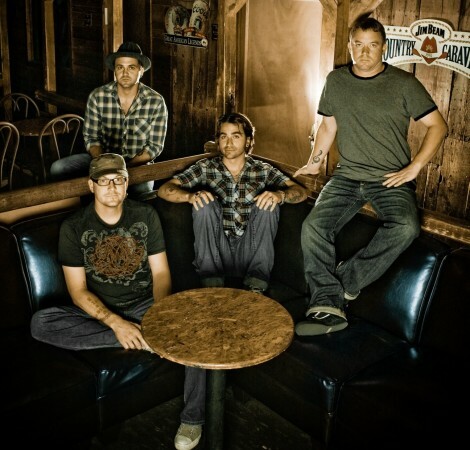 Cody Canada (center) fronts Cross Canadian Ragweed. One of the Stillwater, OK-based Red Dirt rockers biggest hits is titled simply "Alabama." It was in the very American trenches of roadhouse honky-tonks and the early, stoner arenas of grunge, that 33-year-old Cody Canada, front man for Stillwater, Okla.-based Americana rockers Cross Canadian Ragweed, had his destiny revealed. He was meant to rock. Little Cody Canada is 5 years old. He’s at a steak house/bar with his family. There is smoke. There is beer. Little Cody is front row center, a tiny, twangy cherub bathed in a stage light moon. Above him towers this unknown god in a cowboy hat, someone named George Strait. The music starts and little Cody is changed. Young Cody Canada is 14 years old. He’s at a concert, some band called Stone Temple Pilots. It’s his third time to smoke pot and, God help him, the night is magic. It was in the very American trenches of country music landmarks, a glitz ‘n’ glam awards show, and a Minnesota blizzard that Cody Canada had his destiny confirmed. One was before his band scored their record deal. Another was in 2007 at the Americana Music Awards. The last was on a Monday night — Monday! In Winter!— in Minneapolis of all places, and the only thing you could see was sleet and snow. Who: Cross Canadian Ragweed, Mickey and the Motorcars. Where: SkyBar, 136 E. Magnolia. When: Thursday, Nov. 5. Show starts at 10:30 p.m.
Info: Tickets are $12 in advance, $15 at the door. Call 821-4001 for more information. Then their car broke down in Alabama. Love CCR – wish I could be there on Thursday night. They’re going to be here in Statesboro, GA on Wednesday night. I’ll be there to see them for that show. I’m a huge fan of CCR and any of the Texas/Red Dirt country music artists. They blow Nashville away in terms of good country/rock/Americana/whateveryouwannacallit music. I bet Lou likes this band.